Many tools accomplish their work with finesse and precision. In fact, that’s often why we choose to use them. A saw cuts true, a wrench’s leverage easily removes a tough fitting, or an impact driver sinks a fastener without breaking a sweat. But every once in a while we need a tool that gets the job done with brute force – a job that calls for a big, mean, junkyard dog kind of tool. Well, in this case it isn’t a dog, but it’s a hawg – the Milwaukee M18 Fuel Super Hawg 1/2-Inch Right Angle Drill. Every guy has things that make him feel more manly – maybe chopping some wood, perhaps eating a rare steak bare-handed, or crushing an empty beer can on his forehead – hey, different strokes, right? But let me suggest another way: drilling some holes with the Super Hawg. It just might put some hair on your chest or cause you to start grunting like the Tim the Toolman Taylor himself. I’ve reviewed quite a few excellent Milwaukee plumbing tools recently, but not one that I was quite as excited about as the Milwaukee M18 Fuel Super Hawg. The Hawg’s purpose is making holes in wood large enough to accommodate pipes (or conduit for electricians), which is most helpful for plumbers and HVAC guys. It’s powered by Milwaukee’s M18 RedLithium battery pack. The kit I reviewed (2709-22) included two 5.0 amp hour extended capacity batteries as well as a charger. Milwaukee also offers a Hawg with a Quik-Lok chuck, but I reviewed the standard chuck version. The Super Hawg is a beast. At 14 pounds it feels substantial, but don’t let that dissuade you. Anyone who’s ever done the work that the Super Hawg is meant to do knows that the weight is an advantage. It’s normally used in an attic or other tight spaces where you can’t gain the leverage on it to push through the hole – it’s heavy so gravity can help do the work for you. 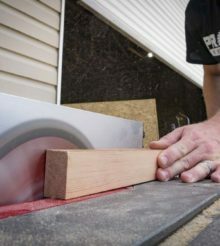 Generally we want our tools to get smaller and lighter, but just as Daniel Elms recently wrote, a hefty tool is sometimes the best tool. The Super Hawg can make holes up to 6 inches in diameter, but standard hole size for most work is 2-9/16 inches. Milwaukee claims that the 5.0 batteries can make 75 of them on a single charge! It boasts a brushless motor (that’s given away by the “Fuel” designation if you’re a Milwaukee rookie), Milwaukee’s RedLink Plus electronic communication system, low speeds of 0-360 RPM, high speeds of 0-950 RPM, a metal keyed chuck, a heavy-duty front handle, and a bright work light for dark attics and corners. Although I plumb new construction, remodels, and retrofits, I find myself most often repiping a home. In fact, I average about 2 repipes a month with Curry and Co Plumbing. Of course, it feels like repipes are predominately done during the blistering Florida summers which makes attic temperatures infernal! Any relief in difficulty is welcome. I’ve been using a corded Milwaukee right angle drill so it’s easy to imagine how the cordless Milwaukee M18 Fuel Super Hawg is a huge improvement. Dragging a cord through an attic and having it snag 10 feet behind you on a truss just isn’t a lot of fun. What’s more, metal trusses can cut through a cord and expose you to electrical shock. Cordless is definitely the way to go. This tool simply blasts through wood. I used Milwaukee’s 2-9/16 inch SwitchBlade self-feed bit (not to be confused with a Forstner bit) and the studs and caps didn’t have a chance. The Super Hawg feels well-built, heavy-duty, and awesomely powerful. More importantly, it’s faster and more convenient than any other right angle drill I’ve ever used – including corded models. The weight does the work for you and helps control against twist injuries in a bind up situation. The Super Hawg not only has an easily-adjusted high and low setting but also a variable speed trigger. Some right angle drills I’ve had were binary, that is, they were either off or at full bore, which makes them very “torque-y”. That’s bad news if you hit a nail or otherwise bind the bit because the whole tool can kick dangerously. Such wrenching has even caused a plumber or two to get hit in the face with the drill. It’s much easier to start and safer to complete a hole with the variable speed trigger. I typically use low in an attic. High speed is great for mixing concrete – stick a paddle mixer in the Super Hawg and mix away. Two safety features stand out to help you control that massive power aside from the weight. First, there’s an auxiliary handle that can be installed to either side by screwing it in place. That’s in addition to the top handle that I end up using most frequently. Internally, there’s also a clutch that will engage in bind up situation – but only in low speed. This is almost critical to saving your wrists and elbows when calling on all the torque the drill has to offer. Sometime the LED light on a cordless tool is more of an afterthought. That’s not the case on the Super Hawg. I found it to be placed well and definitely bright enough to work easily in low light situations. The 5.0 amp hour RedLithium battery is exemplary. One charge usually lasts me through 2 repipes and many of those holes are double and triple caps. I just use a Milwaukee quick extension bit and pull the trigger. Moving from corded right angle drills to the cordless Milwaukee M18 Fuel Super Hawg for plumbing applications leaves nothing to be desired. Milwaukee pretty much took their corded Super Hawg and swapped the cord for battery electronics. There’s still plenty of power to exceed your expectations of what cordless can do and the ergonomics are identical, save for no cord swinging behind you. There’s a lot of weight here at 14 pounds (12.5 pounds bare), but it’s a little lighter than the corded model. The weight isn’t a negative though considering gravity helps bore your holes – unless you’re working overhead or vertically – and it’s not as easy for the torque of the tool to wrench your wrists and elbows. Don’t get me wrong though, I’ll happily take a lighter tool if they can maintain the safety and power of this model. Run time with the included 5.0 amp hour batteries is outstanding and cycling between the two of them should never leave you waiting for a charge. If you’re thinking you’ll need even more run time, an extra $100 will get you two 9.0 amp hour High Demand batteries instead of 5.0’s. I heartily recommend the Milwaukee M18 Fuel Super Hawg to other professionals. At about $350 bare and $550 for the kit I reviewed, it’s not a small amount of money. But I guarantee you that as you move cordlessly through an attic or around a jobsite to blast through wood, you won’t have any regrets. The only thing I’d suggest is taking a look at the Quik-Lok models to see if they’re a better fit for you. There’s no premium on the price to go with the upgraded chuck. this is one of those tools i have absolutely no need for, but at the same time really want to own.